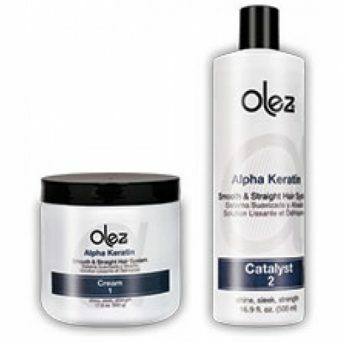 Olez Alpha Keratin combines a powerful and restorative blend of organic butters, alpha keratin, oils, and emollients with natural amino acids to temporarily restructure the hair, transforming frizzy, untamed tresses to silky-smooth, hydrated, and manageable, even on the kinkiest, coarse-textured hair. What makes Olez Alpha Keratin different? AlphaKerTM technology releases microparticles of protein, amino acids, and moisturizers that interact with disulfide bonds, making hair more pliable, resulting in the temporary alignment of the hair shaft. Using a salon-scale, pour 25 grams (0.9 oz.) 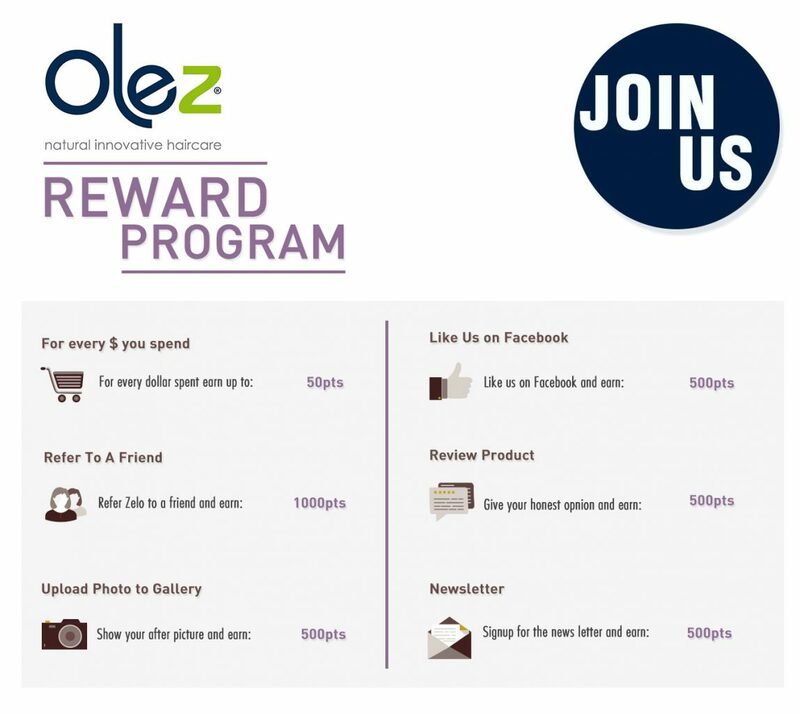 of the Olez Alpha Keratin cream (1) and 25 grams (0.9 oz.) of the Olez Catalyst into a bowl. (This amount of product should allow you to cover an average mead length of hair. In the event you need a bit more, always remember to prepare the solution in equal parts). Your scale should read 50 grams (1.8 oz.). With the use of a dye brush, mix both solutions until a creamy homogenous solution is achieved. Remember: Depending on how the treatment is finished, this solution gives the option to wear hair curly, with defined curls, or straight and sleek. DO NOT WASH HAIR BEFORE APPLICATION. Note: For hair with heavy buildup from thick, oil-based products, cleansing hair before application may be necessary. On 100% dry hair, separate hair into 3 to 4 parts, using hair clips. Wearing gloves, start one part at a time, by taking approximately 1” to 2” (0.5- 1 cm) strands and apply the Solution on each strand. Assuring entire head is completely moistened with the product, use a fine tooth comb to evenly spread the product from root to end. Allow a 60-minute processing time. Rinse hair with water only and remove all excess product before blow drying hair. Blow dry hair 100% with the use of a diffuser. After blow drying hair 100%, separate hair into 3 to 4 parts with a brush and begin flat-ironing approx. 1” to 2” (0.5-1 cm) strands at least 10 times, applying pressure and aligning the strands straight. Flatiron must be at a temperature of 400-450° Fahrenheit, 200-230° Celsius. AQUA, PARAFFINUM LIQUIDUM, CETEARYL ALCOHOL, CETYL ACETATE, PROPILENE GLYCOL, GLYCERIN,COCOS NUCIFERA (COCONUT) SEED OIL, DIMETHYCONOL AND TEA-DODECYLBENZENOSULFONATE, CETRIMONIUM CHLORIDE, ACETYLATED LANOLIN ALCOHOL BHT, DISODIUM EDTA, PEG-90M, HYDROLIZED KERATIN, ALPHA KERATIN, PHENOXYETHANOL, IMIDAZOLIDINYL UREA, METHYLCHLOROIZOTIAZOLINONE, METHYLISOTIAZOLINONE. AQUA, LACTIC ACID, POLYQUATERNIUM-7, PROPYLENE GLYCOL, GLYCOLIC ACID GLYCERIN, POLYQUATERNIUM 37, BEHENTRIMOIUM CHLORIDE, PROPYLENE GLYCOL DICAPRYLATE/DICAPRATE, COCOS NUCIFERA (COCONUT) OIL, SERICIN, TRIDECETH-6 PHENOXYETHANOL, CAPRYLYL GLYCOL, GUAR HYDROXYPROPYLTRIMONIUM CHLORIDE CINNAMAL HEXYL CINNAMAL, BUTYLPHENYL METHYLPROPIONAL, AMYL CINNAMAL HEXYL SALYCILATE,CITRONELLOL, BENZYL SALYCILATE.